Nonhuman vivsection is a double-edge sword. The results of behavioral studies have shown what many of us working with nonhumans already know - animals experience a wide array of emotions, engage in a wide variety of fascinating behavior, and are capable of tool usage, language, social bonding, jealousy, and deceit. Ferdinand is a great liar! For example, would you believe me if I told you I've witnessed a rooster lie? Maybe, but probably not. If I told you that a researcher studied this behavior and published in a peer-review journal his results, would you be more likely to agree? Peter Marler had witnessed what he thought were acts of deception in monkeys. It was too expensive and difficult to study the behavior in monkeys, so he selected chickens. This was the early 1990s and fellow researchers and the public were hardly receptive to complex behaviors, like deception, occurring in nonhumans they ate every day. 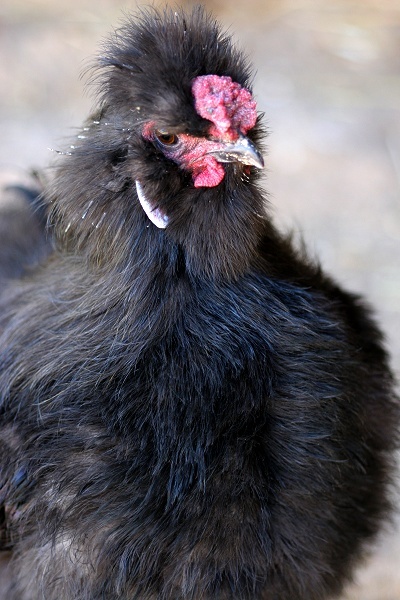 Chickens have more than 20 unique vocalizations that detail very specific concepts and "words" to their fellow flock. One of those calls means "I've found food" and is only exhibited in roosters. When a rooster makes this call, nearby hens will rush over to investigate. Offering food is a great way to curry favor with hens and roosters talented enough at finding food often find themselves with a bevvy of friendly hens. Sometimes roosters make the call, though, and there's no food for the hens to eat. Peter Marler showed that this was intentional, that roosters purposely deceive hens. They do this only under certain circumstances, though. If a dominant rooster is nearby, they won't lie. If a less-dominant rooster is nearby, they may consider lying. If the hens are too far away, they will not lie...but if the hens are close, they will. This is incredible, if you think about it. It means the rooster needs to know the social state of fellow birds, the spatial distance of the hens and what's the "prime" calling time, and he needs to remember the last time he lied. Hens are not dumb - the more a rooster lied, the less likely they would respond to his particular call in the future. And guess what? Marler was mocked by his fellow researchers. When UC Davis hosted a press conference revealing the study results, journalists found it unbelievable that chickens could exhibit such complex thinking patterns...and so they changed every single "rooster" to "monkey", because people could believe a monkey capable of lying but not a rooster. When I tell visitors that roosters can lie, they are duly impressed and amazed. Lying requires a set of skills that not all of us have! But vivisection, even observational behavioral studies, come at a cost. The nonhuman victims are often housed in inappropriate enclosures and, more importantly, are only valuable during the study period. Afterwards, most are killed. Even more disturbing are the studies that show us how amazing and complex nonhumans are, but only if you disregard the welfare of the subject/victim. Google Jack Panksepp. He's pretty much always believed nonhumans experience emotions similar to humans and that you could see it in their brain. He has been a speaker at PCRM's (Physicians Committee for Responsible Medicine) Animals, Research, And Alternatives conference. He came up with seven networks of emotions that he always capitalizes to emphasize the inherent necessity of all seven in all species of mammals. They are: seeking, rage, fear, lust, panic/grief, and play. He considers them fundamental . I wouldn't argue against his theories - it's my confirmation bias showing. I think nonhumans, both mammals, birds, and some fishes are capable of a wide array of emotions, many similar to our own. In an attempt to discover whether play behavior relies on neural pathways in the primitive part of the brain or the more "advanced" part of the brain, portions of the rat's brain were removed. Lobotomized, essentially. They still played, by the way, because play behavior is thought to be the purview of the more primal brain. Which is amazing, because play is incredibly important for all social mammalian species. Rats had a stomach tube inserted that would pump sugar water directly into their stomach if they pressed a lever. One rat left unattended found the experience so pleasurable that he continued pumping sugar water into his stomach until he died. Electrodes were inserted into rats' brains with different regions being stimulated. When areas of the brain associated with seeking or predatory aggression were stimulated, rats would continually press the levers to stimulate that area. When the area of the brain stimulated was associated with anger or rage, rats would avoid pressing the lever. Seeking is pleasurable, anger is not. Puppies were injected with morphine and removed from their mothers. The more morphine they were given, the less panic-stricken they were at maternal separation. Morphine stimulates the same regions of the brain that maternal bonding does. Guinea pigs had electrodes inserted into their brain, in an area that elicits very primal, very scary (to the guinea pig) distress calls. To study the importance of play in social development, rats were socially isolated for multiple hours and then re-introduced to other rats. Those who had been separated exhibited stunted social skills. Since Panksepp studies neuroscience, inflicting punishment or pleasure on the brain is part of his research. His results are indeed amazing. He was thought a fringe, extremist...someone who committed the greatest sin of scientific research involving animals - anthropomorphism or ascribing human characteristics to nonhuman animals. You cannot legally say a dog is happy when he playbows if you are in a room full of neuroscientists. How do I reconcile my feelings of distress and horror at casual acts of brutality with the results that boost public opinion on nonhumans? For example, there is literally no alternative to studying nonhuman neuroscience without accessing brains. None. So there is no escaping exploiting non-consenting animals. I cannot (will not) support that. But is it right to use data that involved unnecessary suffering, pain, and death to reduce the suffering of other nonhumans? You tell me, please.